Parasternal sonography is a sensitive technique for the detection of tumors in the anterior mediastinal and subcarinal mediastinal spaces. 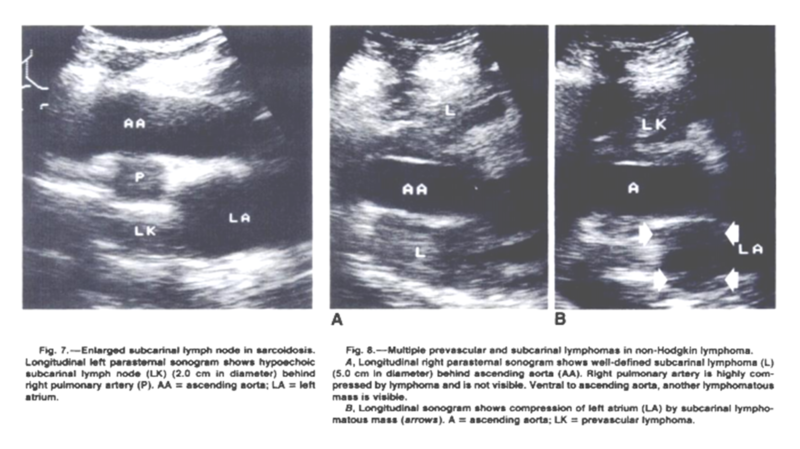 From AJR 150:1021-1026, May 1988, American Roentgen Ray Society. Twenty-seven patients with anterior mediastinal (n = 16) and subcarinal (n = 17) tumors greater than 1 cm in diameter on CT were included in the study. Some patients had tumors in more than one region. Only anterior mediastinal tumors not in contact with the chest wall on the CT scan were selected. Ten patients with large anterior mediastinal tumors broadly attached to the thoracic wall were excluded. 37 patients (11 women, 16 men) were 20-58 years old (average age, 35). In patients with Hodgkin (n = 8) and non-Hodgkin (n = 8) lymphoma, only histologic proof from peripheral lymph nodes was available. In 4 patients, biopsies were consistent with sarcoidosis; 2 were confirmed by mediastinoscopy and 2 by bronchoscopy. 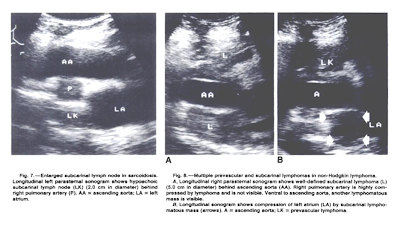 Diagnoses were surgically proved in 2 patients with thymomas, one patient with bronchogenic carcinoma, one patient with a malignant fibrous histiocytoma, and one patient with an unclassified sarcoma. One patient each had mediastinal metastases of melanoma and testicular carcinoma. 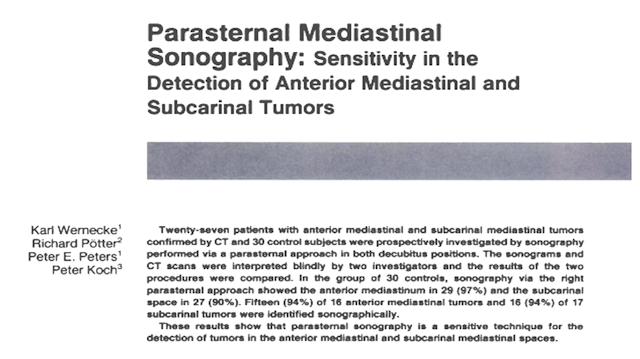 During the same period, 30 patients with normal mediastinal CT scans were investigated with sonography. Twenty-two were referred for evaluation of lymphoma, nine for initial staging and 13 for restaging. In the latter 13 patients, there had been neither previous mediastinal lymph-node involvement nor mediastinal radiotherapy. Eight patients were healthy volunteers. All patients in the control group (12 women, 18 men) had a normal chest radiograph. They were 21-73 years old (average age, 42).